I’ve been enjoying Champions Online lately. It has no where near the amount of polish and quality that WoW has, but it’s still a lot of fun. That’s good enough for me. 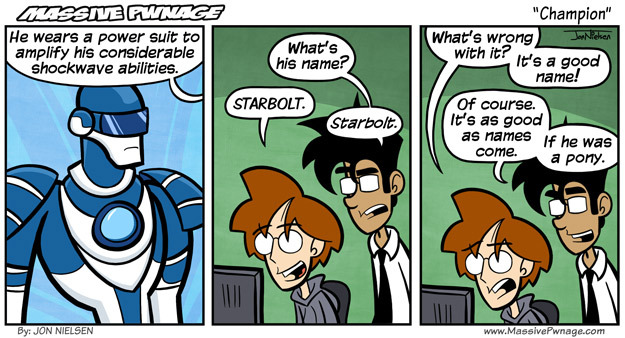 This entry was posted on Monday, October 5th, 2009 at 12:00 am and is filed under Comics. You can follow any responses to this entry through the RSS 2.0 feed. Both comments and pings are currently closed. Lol funny! Champions online looks good too! I was gona get it and make a ninja cyborg ice guy or something. 10/10 on the comic! These comics are 20% cooler 3 years later.